Wiki tells us, a Pearly King or a Pearly Queen is a person dressed in a traditional cockney costume covered in mother-of-pearl buttons. These costumes were treasured heirlooms, hand made and sometime representing much of a family’s material worth. Modern pearlies devote their time to charitable activities. Each individual area of London once had a king and his ‘donna’ (from the Italian for woman), as their wives / queens are sometimes called — one for each of the London boroughs, one for the City of Westminster, and one for the City of London. Also seen in the Disney film Mary Poppins, the musical number “Supercalifragilisticexpialidocious” features a troupe of Pearlies. And in the film Trainspotting, when the protagonist moves from Edinburgh to London, Pearlies are featured. 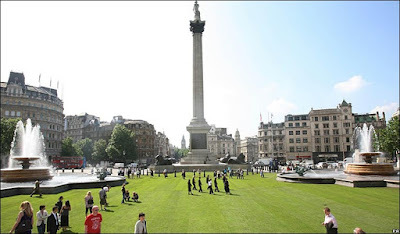 You are currently browsing the archives for the Trafalgar Square category.